Bartram Spring Community in Jacksonville. Bartram Springs is located between U.S. 1 and Interstate 95 off Race Track Road. 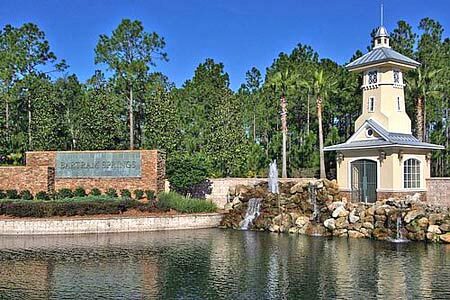 Bartram Springs offers lake and preserve views with amenities for the entire family. This master-planned community features three sparkling pools, a water park, playgrounds, a fitness center and tennis facilities, with nearby shopping, excellent schools and close proximity to downtown Jacksonville as well as historic St. Augustine. Residents and visitors are welcomed to the community through a grand entrance on Racetrack Road that features a wide bridge spanning a lake complete with a fountain. A majestic tower, extensive landscaping and dramatic lighting complete the entry drive. Once inside the community, a winding, landscaped boulevard leads to the multi-million-dollar community center. The center is complete with two swimming pools, a slide tower, extensive decking with gazebos and tennis courts. The community center includes meeting rooms, a party kitchen and a fully equipped fitness facility. A party lawn and dock are located behind the center on a large lake. A large county park is planned for Bartram Springs, which will give residents ample opportunity to play field games, jog, bicycle or just relax under a shade tree. Bartram Springs is convenient to schools, shopping and entertainment. A quick ride provides access to Interstate 95 for both destinations in Jacksonville and St. Johns County. All Duval County schools are nearby and additional schools are planned. For a private tour and showing, please call (904) 307-8998.